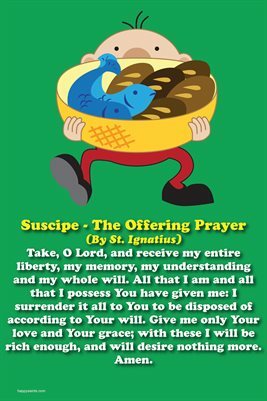 Suscipe - The Offering Prayer (By St. Ignatius): Take, O Lord, and receive my entire liberty, my memory, my understanding and my whole will. All that I am and all that I possess You have given me: I surrender it all to You to be disposed of according to Your will. Give me only Your love and Your grace; with these I will be rich enough, and will desire nothing more. Amen.